Hello everybody! I’m new on the forum. I know it’s way too late to post anything here, but oh well, I couldn’t not to. I still would so much appreciate your critics. p.s. Guys you are all awesome artists, lots of simply amazing works. I learned seriously lot of stuff. Big thanks Jeremy for his new book. Just finished reading it. Truly fountain of knowledge. I just put up a first version of a gallery for this challenge. If there are any mistakes, or if anyone whose work appears in the gallery doesn’t have their full name on-line, please PM me because you’ll only see the name from cgtalk in the copyright message under your work. Thanks a lot for including my Image in your gallery Jeremy. I’m honored being on your site. 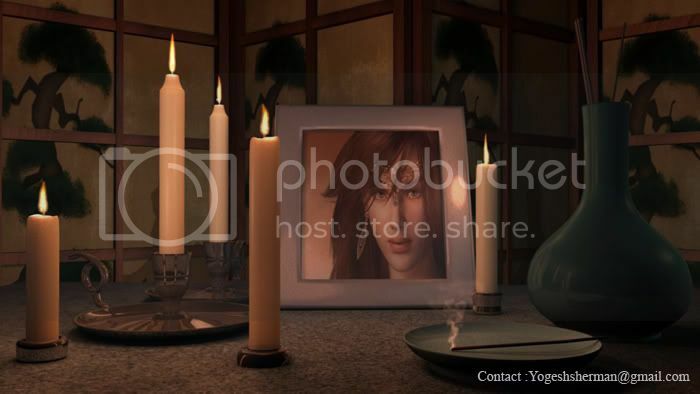 Hi jeremy as suggested by you i am now giving my entry for this challange hope it not too late.i have made it earlier but couldn’t post it .I have used SSS shader for candles and used MR for rendering in Maya but I have not used any GI solution. That looks nice, but it seems very diffusely lit. Maybe it would look more like candle light if the light came from the candle flames and the scene wasn’t so evenly lit all over. Thanks jeremy for your suggestion Now that’s the benefit of joing such a challange you learn so much from the experienced ppl but sorry for my ignorance but it would be easier for me to understand if you can show some image or some link related to my fault.Thanks again. oh is the challenge finished ? It’s a bit late… but still want to share it. Hope you like it. qqlan - That’s amazing! I love the soft shadow on the translucent screen. Great job! al3ashiq64 - Thanks for posting. The flame looks good. Maybe if more of the light came from the candle flame instead of the environment, and the wax were a little more translucent, the scene would have more of a candle-lit look? This thread is archived. If you scroll down to the Challenge #6 section of the downloads page, you’ll see that the models can still be downloaded for your tests, and also that a gallery has been made of top entries. Here is my render, Hope you guys like it.